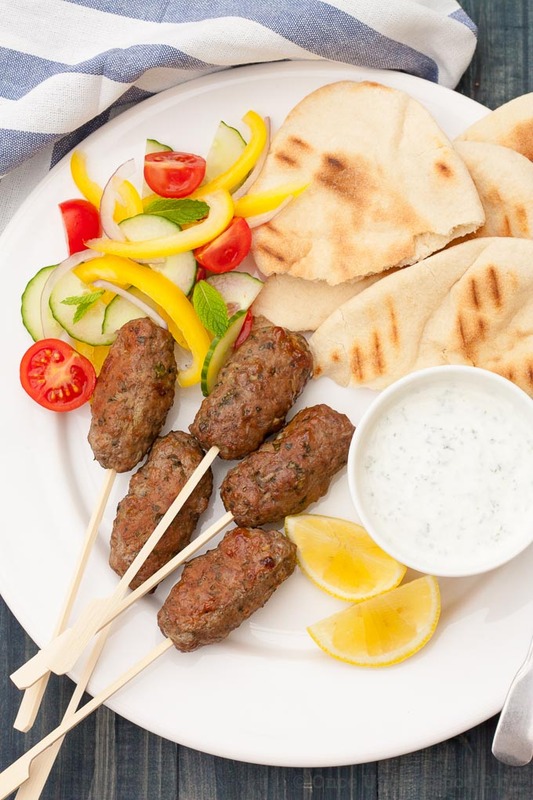 Whether cooked in the oven, on the hob or on the barbecue, these lamb koftas make a great summer dinner. 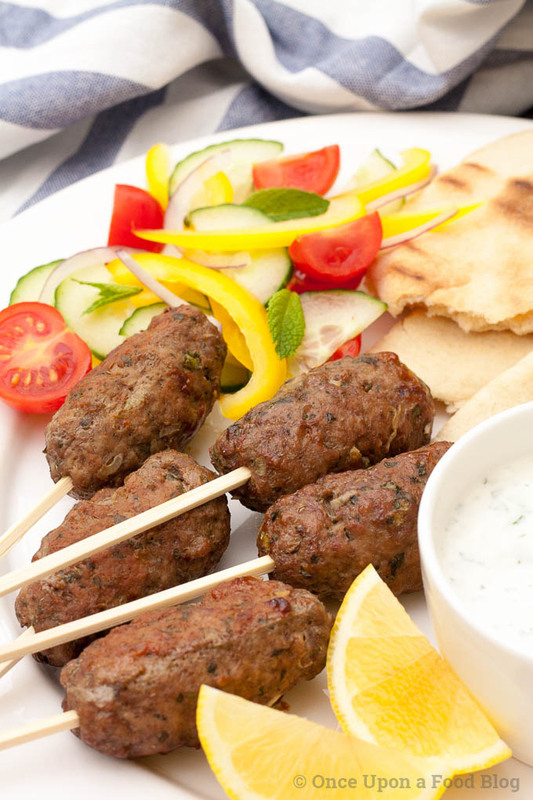 Juicy, fragrant lamb koftas served in toasted flat breads with a herb yoghurt dip and salad – gorgeous. I like to cook these koftas then lay them, and all their sides, out on a big platter, so that people can help themselves as and when they wish. This kind of eating always goes down well in our house. Quick and easy to make, all you need to do is mix all the kofta ingredients together, form into sausage shape patties and cook. 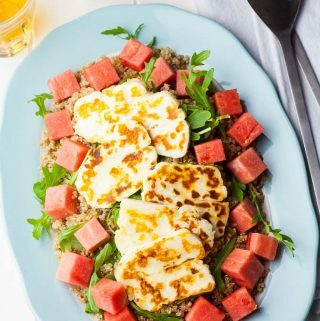 Whilst they are cooking you can make the herbed yoghurt, toast the flat breads and prepare your side salad. 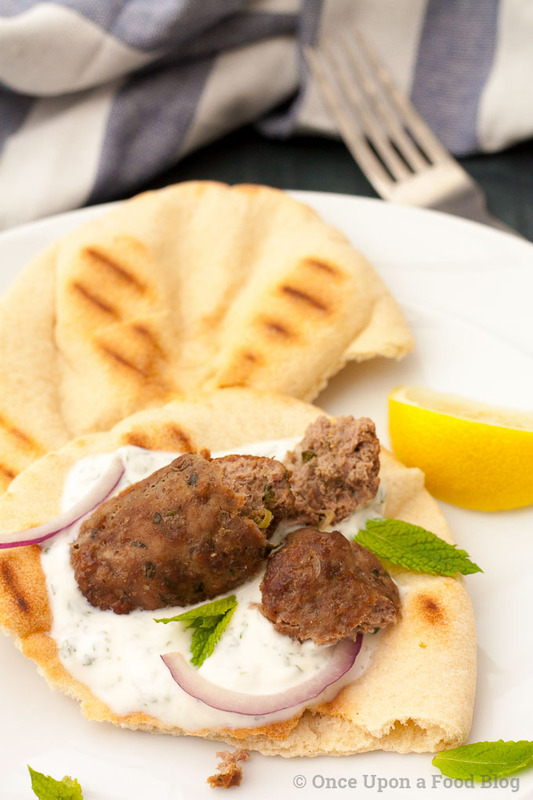 Sometimes I like to serve this with a simple salad, as I have here, piling everything into the flat bread (today I’m serving these koftas with pitta, but I find that any flat bread works) and drowning it in the herb yoghurt. 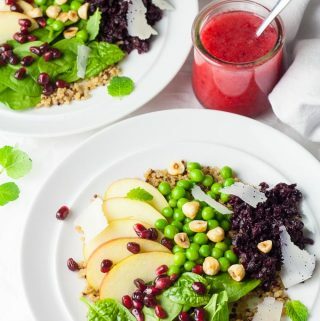 Other times I like to chop fresh herbs (mint, coriander, parsley – whatever takes your fancy) and a spring onion or two and serve the koftas with this herby mix, and maybe a handful of pomegranate seeds, sprinkled over them. 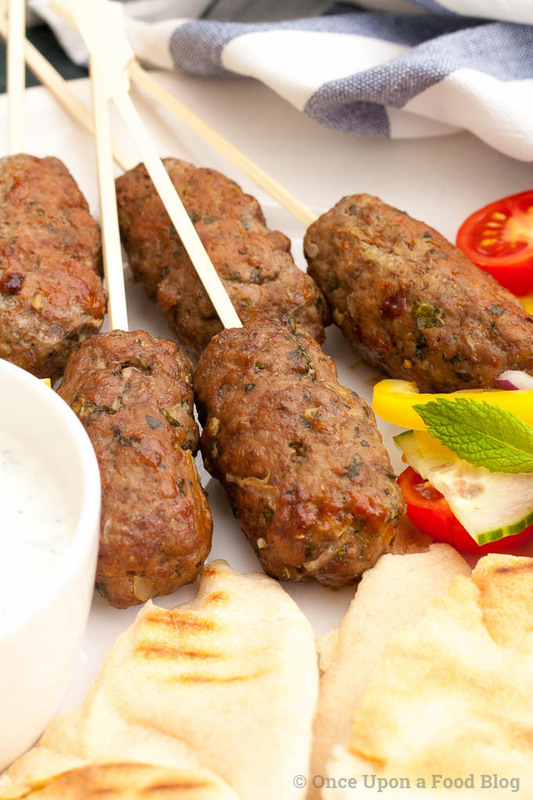 Traditionally, lamb koftas are cooked over a real flame and are therefore served on a kebab stick. 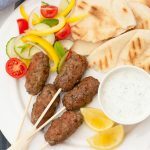 If I’m cooking mine on the barbecue, under the grill or in the oven, as I did today, I cook them on a kebab stick as I think it’s a nice addition. However, if I’m cooking them on my griddle pan I tend to leave the stick out as it gets in the way. If I’m cooking these in the oven I cook them at 200°C for about 15 minutes. On the hob or under the grill they take about 12 minutes on a medium heat and if you’re lucky enough for it to be sunny they are great on the barbeque. Place the kofta ingredients into a large bowl and mix thoroughly with your hands. Divide into eight portions and shape each portion into a long sausage shape. Insert a skewer if using. 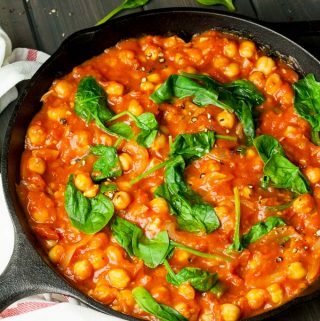 Place on a lightly oiled non-stick baking sheet and place into the preheated oven for 15 minutes or until cooked through. 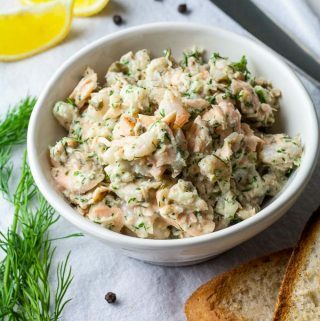 Mix the yoghurt and chopped herbs together. Season to taste. Heat a griddle pan until hot then place the flatbread on the griddle, heating until it scorches. Turn the bread and scorch the other side. Cool on a wire rack whilst the remaining breads are toasted. 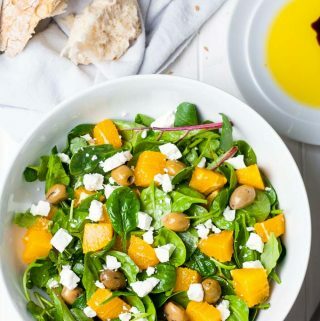 While the flat breads are toasting prepare the salad. 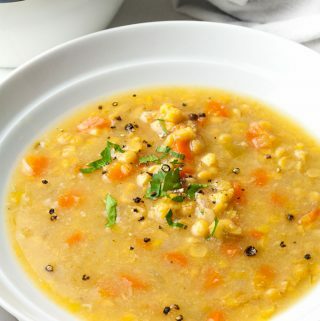 Serve with a wedge of lemon on the side, for squeezing over the top of everything before eating. 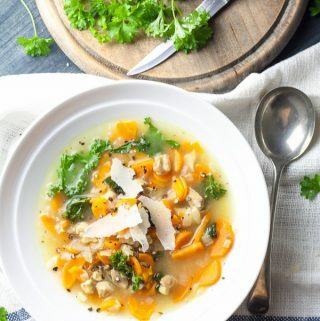 Its the hottest day this year so far (2018), so this recipe is on the menu tonight, Cannot wait! Yum! 🙂 I hope you loved it! Ben (Aged 12 at the time) made these. They were fantastic. The best thing we ate on the BBQ all summer! Wow! 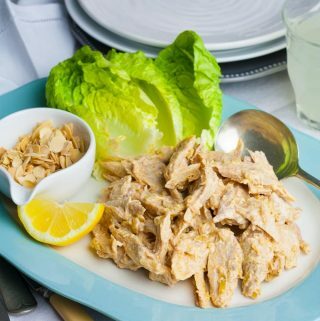 It’s brilliant to hear that my recipes have got kids cooking:) Fantastic job Ben! Amazing. I would definitely try this. Thanks Zorica – glad you like it!